It looks so warm and cozy… lovely pic, Cindy! I thought you’d like this, Kavita. It holds the same kind of warmth you and so many of our friends here on wordpress share with each other. The candles on the tree are real candles. My husband always insisted on real candles and now my daughter carries on the tradition. My tradition was to stand there with a buckter full of water, ready to throw, but luckily I never had to. We only lit them for a few minutes each night, and we all stood around to watch them burn while Xmas choral music played in the background. It was one of those truly magical moments that my husband was brilliant at making happen. Now my daughter carries on the tradition. Missed you too, Mandy – always so good to hear your voice and feel the warmth of your big heart. 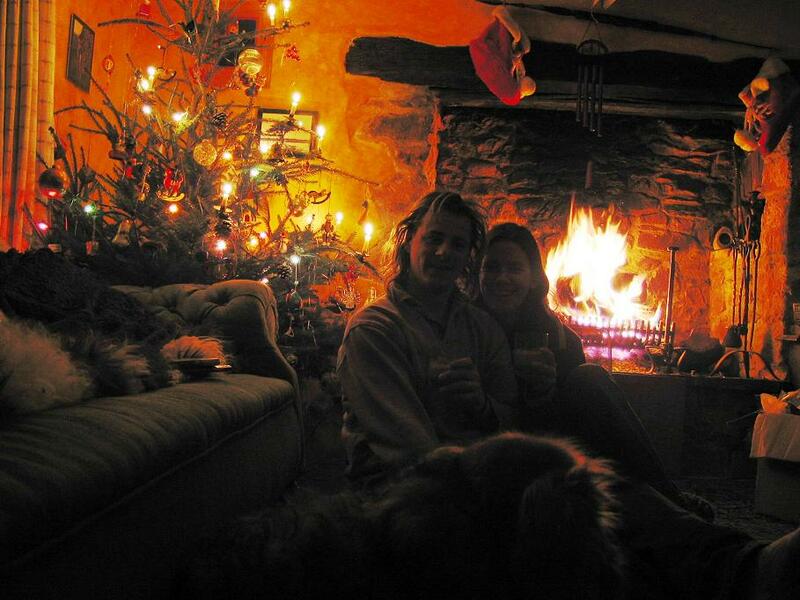 This is my daughter and son-in-law in their little cottage in England a few years ago. It looks all warm and cozy and I love this photo. They look so happy – and they are. Two amazing people, blessed with three children and now living in the larger cottage next door, because they outgrew this when the 2nd baby was born. It was really tiny!! And to you, my friend. That is such a lovely warm photo. It’s just full of the holiday spirit. Hi Pattiken, Thank you for dropping in and joining us by the fire! See (buttercup) below for description of photo. I’m so looking forward to reading your blogs in Feb when this book is handed in. I’ve missed you guys!! Thank you. Have a beautiful holiday season! You too, Talon. As always, it’s good to see you here. Big Hug for Xmas!! 3 days to go — Merry Christmas! Such a gorgeous photo and the warmth isn’t all from the fire either. Family is precious and at Christmas time even more precious if that’s possible.